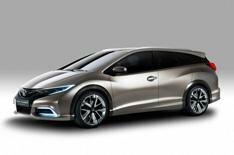 Honda Civic Tourer exclusive preview | What Car? Want to see the Honda Civic Tourer in full production form for the first time? What Car? is offering you the chance to do just that at an exclusive preview months ahead of its on-sale date of early 2014. From the front, the Tourer is unmistakably a Civic, but its roofline is higher and longer than the hatchback's increasing boot space and practicality. Honda hasn't revealed boot capacity, but it claims the Tourer will offer class-leading load-lugging capabilities. Are you considering the Honda Civic Tourer for your next car? Do you want to be one of the first to see it? This is your chance. Send the above to [readertestteam@whatcar.com](mailto:readertestteam@whatcar.com?subject=Honda Civic Tourer preview) as soon as possible to secure your place.